It may seem early, since Halloween is just next Wednesday, but right after that, one week from today, we will begin the 2018 PopCult Gift Guide. We are shaking things up a bit this year, which is sort of the norm, since I don’t think we’ve ever followed the exact same format more than two years in a row, but in 2018, we are once again making some changes. This year the PopCult Gift Guide will begin on November 1, and the last day for it will be November 30. The master list will be posted on that final day, and then I’ll be done with it for the year. The reason for this is that, many of the items I suggest this year will have to be ordered over the internet, and I wanted to give you plenty of time to get your gift-y goodies before Christmas. Also, I’m going out of town the first week in December, and don’t want to have to tie up any loose ends. For 2018 I will post three or four gift suggestions every day in November. These will include books, CDs, DVDs, toys, gadgets, gift certificates or gift cards and anything else that I think will make a cool gift. For the month of November, The RFC Flashback and Sunday Evening Videos will go on hiatus.They’ll be back, and just in time for the holiday season to really kick off in earnest, on December 1 and 2. Every Saturday will be BIG TICKET DAY, where every gift suggestion will cost more than a hundred bucks. The rest of the days I’ll try to suggest gifts that are appropriate for a more modest budget. The plan is to offer more local gift ideas than I have in the past. I’m aiming for at least one local item per day, but that may not hold true for BIG TICKET DAY. 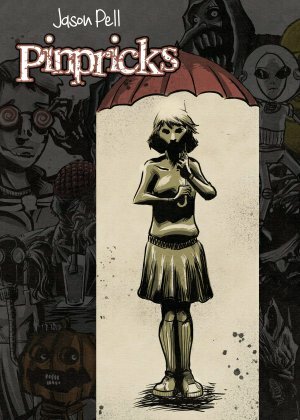 As an early tip, something that will appear in the Gift Guide next week is Jason Pell’s graphic novel, Pinpricks (that’s the cover to the left). I plugged the Kickstarter for this cool project last March, and Jason stunned everyone by delivering it a month ahead of schedule. Pinpricks. A book of tiny and terrible oddities is not really a novel, per se. It’s one-hundred and one illustrated short stories of misfits, monsters, and the terminally awkward. Spoiler alert here: I enjoyed it enough to make sure that it had a spot in this year’s PopCult Gift Guide. It’s so good that it was the very first pick. I will post a detailed review with links to how you can order it next week, but for now, you ought to know that Jason will have a booth at The West Virginia Book Festival, this weekend. Jason will be in booth 112, and this is your chance to buy Pinpricks and his earlier graphic novels, like Zombie Highway and Suicide 5, and get them autographed to the graphic novel fan on your gift list. 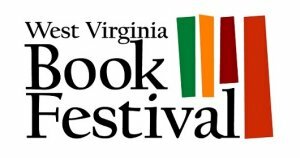 You should make it out to the West Virginia Book Festival anyway, because there will be all kinds of great gift ideas there among the authors and publishers. You can read more about the West Virginia Book Festival HERE. 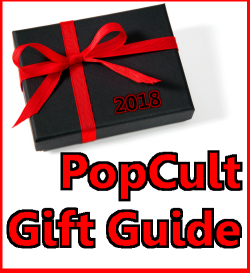 The 2018 PopCult Gift Guide will begin Thursday, November 1, with posts going live between Noon and 4 PM, Eastern Time.